Spring weather is cause for creating a menu that’s equal parts savory and sweet. April showers bring May flowers, but they also bring a plethora of bright colors and mouthwatering produce to the aisles of our favorite farmers markets. Put some pep in your step—and in your recipes—by mixing in a fresh, flavorful dish to your menu this spring. 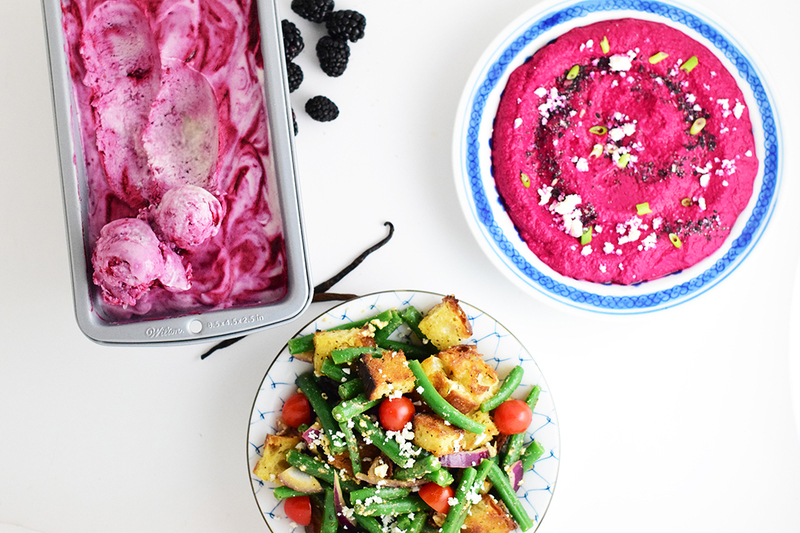 From vibrant beets to juicy blackberries and crispy green beans, there’s plenty of delicious fare to dish out. Before the unbearable 100-degree weather hits, whip up an appetizer, entree and dessert that serve as perfect table accoutrements to bring to a group picnic or outdoor gathering. Wash and peel the beets. Wrap them in foil and roast for one hour at 425 degrees. Once the beets are cool enough to touch, dice them into quarters. In a food processor, combine the beets with the chickpeas, tahini, water, lemon juice, cumin and paprika for a little heat. Pulse on high for three minutes. While pulsing, stream the olive oil into the food processor. Top the hummus with thinly sliced scallions, feta, poppy seeds and sesame seeds, and serve with crackers and veggies. Hummus can be stored without the toppings for as long as a week in an airtight container in the fridge. Place the sliced red onion into a bowl of water to take the bite out. Set it aside. Wash the green beans and remove the ends. Chop them into 3- to 4-inch pieces. Blanche the green beans by dropping them into boiling water for two minutes, then shock them in ice water to stop the cooking. Remove them from the ice water and set them aside. Fry the bacon slice until crisp. To make the bread, chop white or sourdough bread into 1-inch cubes. Toss with olive oil and Italian seasonings. Broil for five minutes, tossing once, until the bread is crisp. To make the dressing, whisk together the olive oil, garlic salt, Italian seasoning, mustard and vinegar. In a large bowl, toss the green beans with bread, tomatoes, feta cheese, red onion and crumbled bacon with dressing. Serve immediately. Pulse the blackberries in a food processor until smooth. Pour the blackberry paste through a fine-mesh sieve to strain the pulp. Discard the pulp. Place the blackberry juice into a small stovetop pot. Combine with the lemon juice and sugar over medium heat. Stirring frequently, reduce the blackberry juice for five to seven minutes until it’s thickened. Remove it from the heat and let it cool. In a separate bowl, beat the heavy cream on medium speed until medium peaks form, about five minutes. Reduce the speed and gently pour in the sweetened condensed milk, mixing for one minute. Using a spatula, fold the vanilla extract and vanilla bean pods into the cream. Stir in the blackberry paste and place the mixture into a metal loaf pan. Cover and let it chill in the freezer for at least five hours before serving.